Just in time for Christmas 1956, Life magazine published a special issue, “The American Woman: Her Achievements and Troubles.” It is a curious, equivocal document, on the one hand celebrating women’s new freedom (as embodied by their ability to drive), on the other emphasizing the “duties and responsibilities” that come with freedom. But one American woman, at least, saw no need to be the passive recipient of other’s innovations. 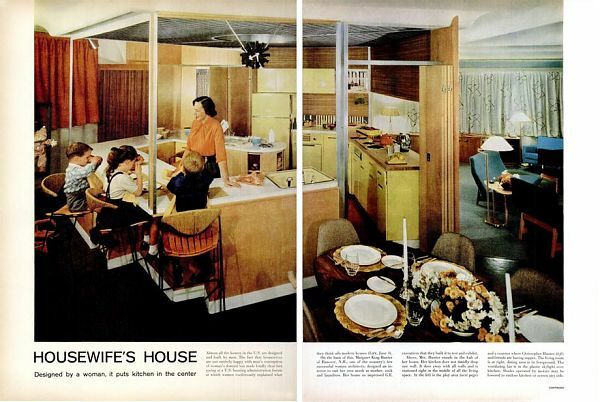 On page 134, “To suit her own needs as mother, cook and laundress,” in her “Housewife’s House” she has placed the kitchen at the center, with a playroom on one side, dining area on another, and the living room on a third. Thanks to sponsorship from GE, her model kitchen comes with motorized shades, so that any side may be screened, along with up-to-date lemon yellow appliances. Photos show what we would now refer to as a “breakfast bar,” to which kids (including her son Christopher) have pulled up wire-and-cord stools. Kids can help themselves to snacks via a small refrigerator accessed from the playroom side of the counter; there’s also a whole cork-covered wall to hold their pin-ups. Perhaps the cleverest touch is in the entrance hall, where stainless-steel pans set into the floor make it easy to remove dirt from muddy boots, and mesh doors allow wet coats to dry. When you live in New England, and you’re the one cleaning, you think of such things.